This Himalayan Pink Salt is wonderful for use in the kitchen or at the table in a salt shaker. 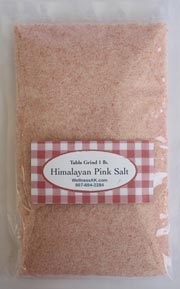 This ultra-pure Himalayan Pink Salt is is wonderful for use in the kitchen or at the table in a salt shaker. It doesn't clump and attract moisture like gray sea salt. It can also be used for mixing brine, but it will take longer to dissolve than the Super Fine Grind. You'll love it! Shipping is fast. All items are packaged well.